This (smaller) headpiece is made from draped and sculpted woven buntal straw in a range of colours, mounted on a narrow tulle wrapped alice band. 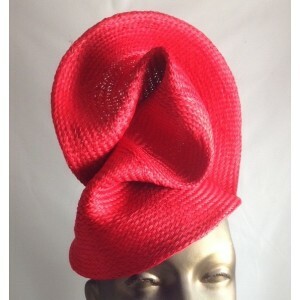 Colours available currently for this style are red, ivory, black, navy, yellow, orange, hot pink, cobalt blue. This headpiece is striking and easy to wear. Sent to you by Express Post in a pretty gold hat box.